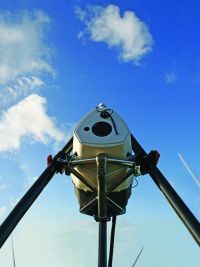 ZephIR’s Dual Mode (DM) Continuous Wave (CW) lidar has been trialled on the nacelle of a test turbine at DTU’s Risø campus with a full scientific presentation on the findings was made at the recent EWEA 2014 conference in Barcelona. Comparisons were then studied between the ZephIR DM’s data and that from the turbine’s SCADA unit and wind measurements from the mast’s instrumentation. Hub height measurements were recorded while the unit’s unique full-rotor scanning also provided rotor-equivalent wind speeds, a quantity now under consideration for inclusion the forthcoming new IEC 61400-12-1 CD standard. ZephIR DM’s built-in real-time inclination and roll sensors also ensure high availability and compliance with measurement height tolerances, irrespective of nacelle motion. In collaboration with DTU Wind Energy, Zephir Lidar will now carry forward the ZephIR DM through a further trial to investigate its ability to provide reliable measurements in wind characteristics through high-fidelity turbine-mounted data from around the full rotor disc. ZephIR Lidar will continue to work closely with DTU Wind Energy to ensure ZephIR DM receives IEC standard compliance for use in power curve assessment, utilising the extensive DTU Wind Energy test facilities at Høvsøre. New work will be carried out with ZephIR DM in DTU Wind Energy’s UniTTE project lead by Senior Scientist Rozenn Wagner, designed to measure wind conditions for wind turbine power performance, which has received a research grant of approximately DKK 14million from the Danish Council for Strategic Research (DSF). The goal of the project is to develop procedures for power curve measurement and load assessment in any type of terrain, including complex terrain, using nacelle mounted lidars and provide the basis for new standards. Two major measurement campaigns using nacelle lidars, including a ZephIR DM are planned in UniTTe in the coming years, one in flat terrain and one in complex terrain. “Many years have passed since our installation of a ZephIR on the top of a turbine in 2003, but the core technology – continuous wave lidar – remains the same and the unique abilities it provides have given DTU Wind Energy to continue the investigation and validation work toward standardisation. A full copy of the technical paper relating to the nacelle mounted evaluation test can be found on the ZephIR Lidar website: www.zephirlidar.com/resources/publications.